A ​bead spinner is a beading tool that helps you string numerous seed beads quickly. It's useful when you need to string a series of beads that are all the same color and size, or a pre-made mix of beads that you'd like to string randomly. It does not work when you want to string beads in a pattern. Beader spinners are helpful for making stretch bracelets, bead crochet, kumihimo, and French and Victorian wire flower making. There are many brands, styles, and sizes of bead spinners to choose from. The spinner in the photo is a Bead-N-Spin Junior by Beadalon. It's made of solid wood and the bowl has an outside diameter of about 3.5 inches. Whichever brand you choose, I recommend that you select a model that is no smaller than this, and one that is made of wood rather than plastic. Many people find that plastic spinners are more difficult to use. Some bead spinners are motorized and battery operated, but a manual model is quieter and just as easy to use. The stringing material you use with your bead spinner depends on your project and the size of your beads. The best materials to use with a bead spinner are fine cords such as woven nylon, silk thread, and stretch cord. You can also use fishing line types of beading thread such as FireLine and PowerPro or beading wire for stringing, but those can be a little trickier to work with. To make beaded wire flowers, your stringing material will be the metal wire itself. Once you have your spinner, simply place the bowl onto the spindle on the base. Then pour in your beads. It is easier to string the beads if you keep the bowl at least half full. You can always pour in more beads than you think you'll end up using and put them back in the package when you are done stringing. Unless you're stringing beads onto metal wire, you must use a needle with your bead spinner. Most spinners come with a curved needle, which seems to work best with standard beading threads. If you plan on using cording with your bead spinner, you can use either a curved big-eye ("J") needle or a collapsible-eye needle (also called a twisted wire needle). If you buy silk cord on a card, it typically has a collapsible-eye needle built in. Once you get used to your bead spinner, you can use the same kind of straight beading needle that you use for beadweaving such as a Tulip needle. Straight needles are slightly more challenging to use with a bead spinner since the beads slide off of them as easily as they slide on. Slide the end of your stringing material through the eye of the needle and fold over a tail at least 3-4 inches long. Depending on the requirements of your project, you may also want to secure the other end of your stringing material with a bead stopper or a stop bead. If you're using bead stringing wire, you can begin by attaching the first your crimp bead or clamshell bead tip to the loose end of the of stringing wire. Hold the needle with the fingers of your dominant hand and submerge the very tip of the curved portion of the needle in the beads. Position the needle at no more than about a 45-degree angle from the surface of the beads; the needle should be relatively close to parallel with the surface of the beads for best results. Use your non-dominant hand to slowly turn the bead spinner bowl by its handle. If you're right-handed, turn the bowl counter-clockwise; if you're left-handed, turn it clockwise. Keep the needle stationary with only the very tip submerged, and allow it to skim beads off of the surface. 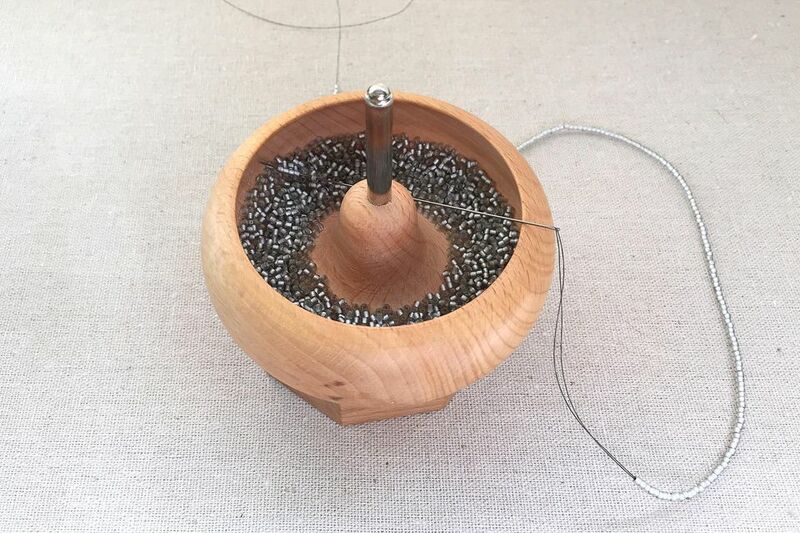 Very gradually speed up the rotation of the bowl until several beads at a time start jumping up onto the needle. Be patient with this and practice with different speeds and needle angles. Before long, you should develop a technique that works best for you. Just be careful not to spin the bowl too fast, which can cause beads to fly out. When the needle fills up with a line of beads, stop and push them down onto your stringing material. Repeat the above process to string as many beads as you need. If you are stringing with a straight needle or metal wire, follow the same steps as for a curved needle, but spin the bowl clockwise if you're right=handed and counter-clockwise if you're left-handed. Experiment to discover the needle angle and spin speed works best for you. You should get to the point where bunches of beads skim up onto the needle in groups. With straight needles, it is easiest to hold the needle about 3/4 inch up from its sharp end. This limits the number of beads that your needle can hold, but it makes picking up the beads easier. With practice, you may be able to hold your needle closer to the eye. Is FireLine Better for Beading Than Fishing?